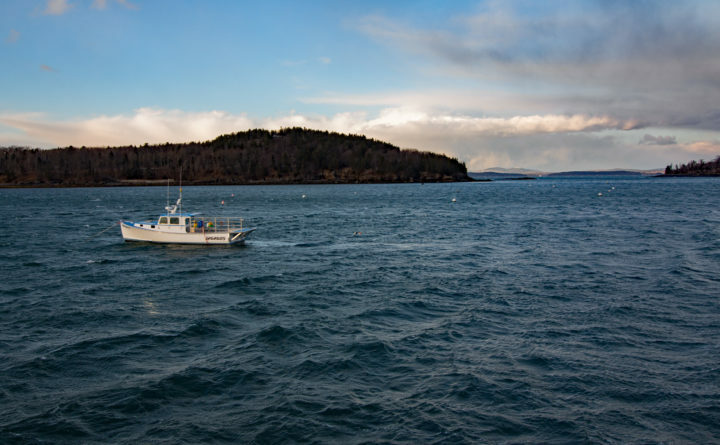 A lone fishing boat bobs on the waves near the Bar Harbor docks. A small species of shark that is fished for food off the East Coast has declined slightly in population, and fishermen will be allowed to catch slightly less of it in the coming year. Spiny dogfish are harvested off several Atlantic states, and they are especially popular in Europe. The Atlantic States Marine Fisheries Commission says a recent assessment of the shark’s population shows a decline in the number of spiny dogfish. The commission says the decline requires a 46 percent reduction in the dogfish quota for the 2019-20 fishing year. The commission says the reduction is designed to avoid overfishing. Fishermen will be allowed to catch about 20.5 million pounds of the dogfish in the new fishing year. They caught nearly 27 million pounds in 2016.